All of our studio photo shoots are FREE. Whether you want family portraits or model portfolios, all of our shoots are completely free. If you wish to order some photograph (there's no obligation) you only pay for those. We are professional experienced photographers who live and work in the Manchester area. We can provide a photographer for any function within Greater Manchester whilst our studio is in the Broadstone Mill Shopping Outlet. Our head studio is located in Broadstone Mill. 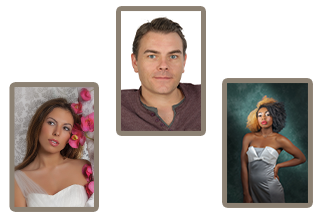 We have a range of backdrops and lighting equipment that will cater for all needs from portrait photography to modelling assignments. See our studio location page for directions. In addition to our studio based photography, we are able to take your portraits or model shots at any location you choose (within the Greater Manchester area) We have a range of high quality portable equipment that can be utilised in any location - however remote. Remove wrinkles, blemishes, signs of ageing and improve skin tones. View our Photo Editing page for more information. We recognise that immigration and border control regulations are changing constantly and, therefore, we keep updated on all of these changes. 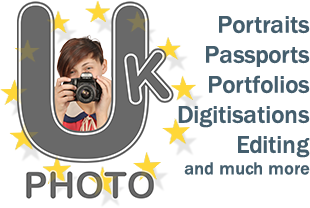 We provide British and international passport and visa photographs. For a couple of years now, the Indian visa photos have changed to the square American size of two inches, so you can no longer use the standard British ones. For the US visa photos you may require the digital file for your online application (ds-160 or similar). We email these files to you automatically, just in case you need them. In the case of Canadian passport photos, nothing has changed recently, although the Canadian citizenship photos no longer require a signature block. Baby passport photos are available for all nationalities. It can be impossible to use a photo booth for babies so this is an area in which we specialise. Whether you bring your baby into our studio, or upload your own photo, we ensure that is passes the regulations. If you live in the Northwest of England, especially Manchester or Stockport, you can visit our studio at Broadstone Mill. We will take professional passport photos for the price that you'd expect to pay at a kiosk. We are not based in the city centre, but you can find us easily using the maps and images on the 'studio location' page. If you live anywhere else in the world, you can upload your own images to us. Free Airbrushing on studio shoots. BRP Photos (biometric residency permit) available. Video8, Hi8 and MiniDV tapes to DVD or MP4. Super8 and Standard8 Cine Films to DVD or MP4.